Without experience, generating exclusive mortgage refinance leads is always easier said than done. You likely already figured that out. While it may not be easy or cheap, it is definitely worth it if you have patience, a marketing budget, and dedication. There are specific advantages working refinance deals over pursuing buyers. 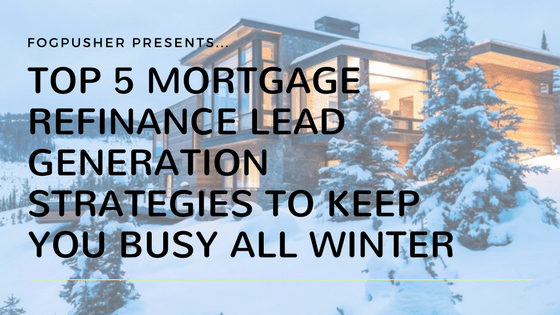 Whether you decide to take advantage of my advice regarding refinance business or disregard it, creating a mortgage lead generation funnel is one of the best decisions you can make for your business. Generating exclusive mortgage refinance leads may feel complicated but really you just need to position yourself correctly and work with a mortgage lead gen specialist who has experience and knows what they are doing. Plus, our actual client results speak for themselves. 1. Establish yourself as the refinance expert. Invest time and money in a website/sales funnel that serves as an authoritative resource for any prospective clients seeking to learn more about mortgage refinancing. This part of the strategy is the same for generating commercial and residential refinance leads. This part of the process is essential to maximizing your success everywhere else. After all, people don’t want a loan to refinance their home, they want financial freedom, cash to solve their specific problems, etc… In order to ensure that you get a shot at helping them, you need to establish comfort in your person, pricing, and product – online. Display refinance testimonials (preferably video) and help people feel comfortable with you, your mortgage refinances products and your rates. Keep track of your wins on your website, social media, etc… and generate fresh content everywhere. If you are not accustomed to generating original video or blog content, this may feel like a daunting task – but with the right marketing and content creation tools, it’s really not so bad. Some of my favorite/free resources for creating content are below. Every time you are able to save a client money or put them in a better situation in their life, you should be documenting this publicly so people can see what kind of results you’re producing. Identify your target audience (buyer personas) and specific areas of expertise. Create video and original blog content answering questions for prospects in this space. #2 explains how to find the right questions. 2. Figure out what questions your ideal prospects are asking. Answer these questions and deliver the content. It’s as easy as recording a video of yourself on your smartphone than using very simple phone apps to edit. Then share this content in a way that is likely to be seen by prospects who can benefit from it. YouTube is now the largest search engine for people looking to learn things and it’s your perfect opportunity to put yourself out there in a way that establishes credibility and trustworthiness at the same time. For example, whether you’re targeting residential or commercial refinance prospects, brainstorm a list of questions your prospects are most likely to be asking. You can also use websites like Quora to find out the exact questions people are asking. I find more often than not that mortgage professionals forget that the general public does not understand mortgage terms and lingo like they do. The idea is to explain things like you’re talking to an 8-year-old. This is very important. If you go over their head they will be instantly turned off. The same goes, in many cases, for commercial property owners as well. “Is my original mortgage paid off when I get a refinance loan? Conduct some YouTube research to see what other types of competition you have out there answered these questions. Throw in your local geographical area and see how many people are asking these questions for your particular area. There may be some people making videos of these sorts but what I often find is that the presentations are very boring and the tone of voice is generally extremely monotone and the vocabulary is over the average watcher’s head. You can tell how effective these videos are as many of them have less than 10 views after being up for a year. 3. Create and deliver your original content to a highly targeted audience group using social media advertising. Instead of sending out postcards, use better and more comprehensive technology to reach out two potential refinance clients. Social media websites such as Facebook, Twitter, LinkedIn, Instagram, and Pinterest are all actively collecting information about the behavior of their users, in order to enable more accurate advertising efforts. Each has their own special way of gathering information and making it available to advertisers. Just keep in mind, many people use particular social media services in order to avoid advertising rather than to be bombarded by it, so proceed with caution. Your social media ads should not feel like advertisements and there must be constructed in a way that is not perceived as advertising. Not only is this true for generating mortgage leads, but it also applies equally to generating leads for real estate agents/brokers. If you don’t have full mortgage sales funnel up and running, you will run into significant challenges capturing the lead information. Lead capturing is an art and a science. Once you have professional sales funnel in place, this process will go much smoother. 4. Take advantage of search engine PPC advertising to catch mortgage refinance leads at the right time. Social media ads can be great at getting the right message in front of the right person but search engine marketing has a tremendous advantage in that it allows you to get your targeted message in front of the right person while they’re looking for the information you have to give them. Social media ads are geared towards catching a highly specific audience. PPC ads, on the other hand, target an audience showing intent to receive your information. PPC ads don’t use the same type of audience targeting, so the key is to create a highly targeted ad, landing page, and offer geared very specifically to the search terms identified. Since PPC advertising is fairly competitive it can also be one of the more expensive strategies to generate mortgage leads online. The key is to start slow, make test groups for everything, and as your tests give you feedback – slowly ramp up your ad spend according to the results you receive. Using tools like SemRush, Keywordtool.io, Google AdWords Keyword Planner, and Quora, you should be able to come up with some strategic angles which are not being competed for heavily – but these things take time. Always consider double meanings in Search terms and keep in mind that just because somebody is searching a certain way does not mean they have the same objective in mind that you think they have. 5. Install tracking and remarketing codes on your website. This enables you to remarket visitors who stopped in to see your refinance page but didn’t convert. There’s an old saying that a prospect has to see an ad 7 times before they take action. Fortunately, technology has dramatically reduced this figure and allows us to get highly targeted messages in front of prospect in a way that helps them convert much faster. The most important retargeting / tracking codes to install on your website are the Google remarketing tag, the Google analytics tag, and the Facebook pixel. If you use these strategically, you will be better-positioned to generate high-quality mortgage leads. If you have plans to Target LinkedIn, Pinterest, or Twitter, there are also tracking codes available through these websites which enable you to gather additional Insight on your website visitors and continue your remarketing efforts. There’s always another possibility which would make life easier for you. Having us take care of this entire process for you would save you significant time and headaches. In addition to having personal experience as a Realtor and as a mortgage loan originator, our team is also highly specialized, making it able for us to achieve some of the incredible mortgage lead generation results our clients are currently experiencing. Our entire team is highly experienced in mortgage lead generation, social media marketing, and mortgage and real estate sales funnel creation and implementation, etc. Ready to Re-Gain Control of Your Business? Please fill out the form at the bottom of this page. Recruiting Mortgage Loan Originators To Generate Leads? Stop.